Rarely have I ever seen live the unbridled virtuosity that Zakir Hussain Alla Rakha Quereshi and Rakesh Chaurasia demonstrated last Wednesday night in Florida State University’s Opperman Music Hall. They played to a hall so packed that people were hanging from the rafters, most of whom understood Hussain’s international reputation and his status as a world music demi-god. To say that these players were amazing would be a disservice. No one familiar with Hussain’s musicianship was surprised in the least with the dexterity, precision, and sensitivity they heard from either musician. The pleasant surprise here – thanks to Seven Days of Opening Nights and their Director, Steve MacQueen – was to see such a global drumming giant diversify the fall concert lineup at FSU. A sizeable Indian/Indian American sector of the audience expressed delight not only that Hussain was here in Tallahassee, but also that he played with the nephew of the great flute maestro Pandit Hariprasad Chaurasia. During their whole visit, Hussain and Chaurasia demonstrated a forward looking approach to the contemporary practice of Indian “classical” music. During the concert, we watched sons of masters, two musicians who had never played together, meet each other musically. They communicated clearly according to the systems they had learned so well as younger men. They improvised within those boundaries, at once honoring their gurus and pushing the envelope with tremendous technical prowess. Hussain explained the next day during a masterclass that he had played with Chaurasia’s uncle and teacher. Chaurasia, for his part, had watched the tabla player onstage with his uncle for years before playing with Hussain. The pair sounded as if they had been born playing together. 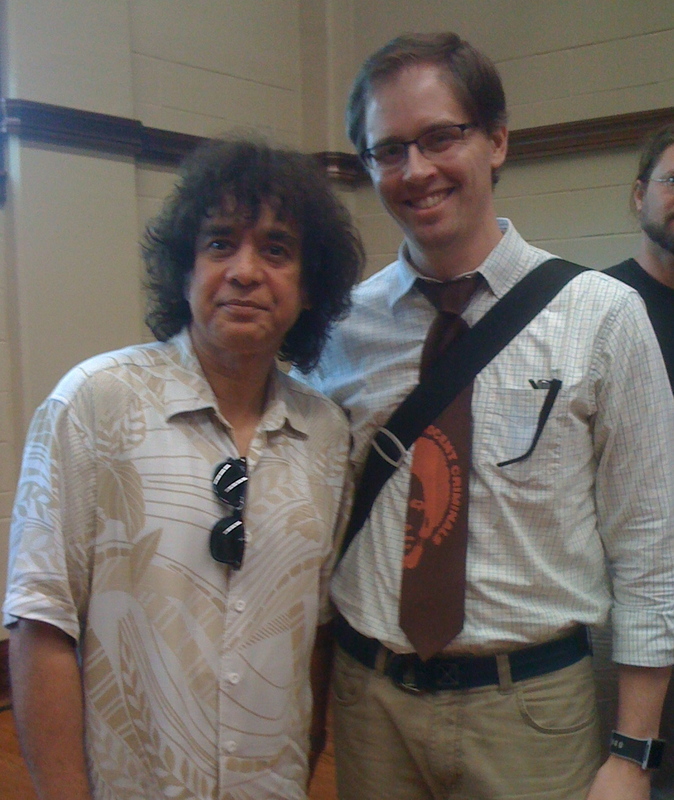 At other points in his masterclass, Hussain emphasized that “the purists in India” had little to do with the kind of musician that drummers like Airto Moreira, Babatunde Olatunji, and Giovanni Hidalgo inspired him to be. His reverence for Indian masters paralleled this respect for other virtuosi. His comparisons of Indian musical systems to jazz made perfect sense of the fluidity he had with Chaurasia onstage. 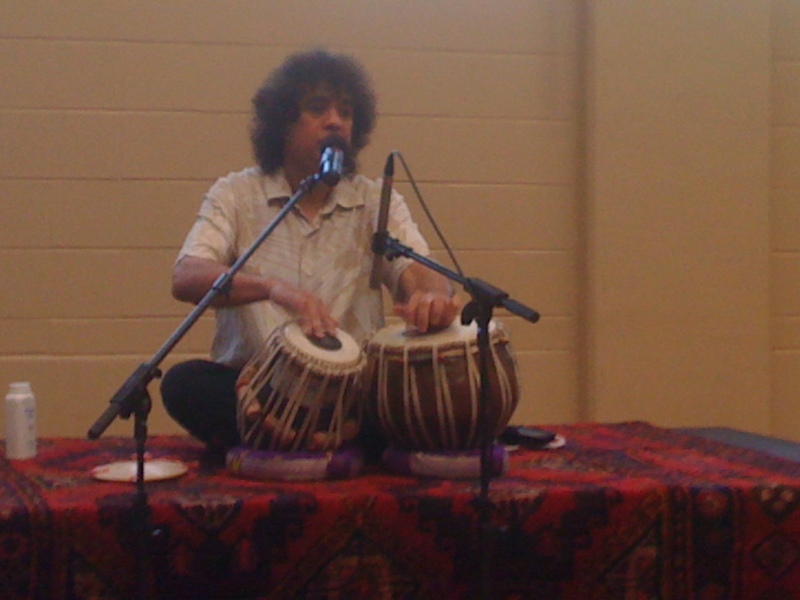 Starting with the long view – a historical backdrop about where tabla music had come from – Hussain explained how relatively new it is and how the instrument is still changing and developing in terms of its technique. He made crystal clear that he strives to stay within the musical and theoretical boundaries that his musical pedigree demands while simultaneously revolutionizing tabla technique. In both the concert and the masterclass, these technical elements surfaced in the complex counterpoint not only between raga and tala or between tabla player and flutist, but also between right and left hands. What Hussain plays with either hand could be food enough for even the most sophisticated ears; what we hear when they play together is something that neither hand plays on its own. The ears respond with similar mesmerizing bewilderment as when listening to good Indonesian gamelan music, a pointillistic string quartet, or the intricacies of Kisoga embaire (wood slab idiophone) music from eastern Uganda. Unlike these, however, Hussain and Chaurasia’s collaborations are so highly improvised as to be fleeting, leaving the feeling that even if precisely the same combination of sounds was never made again, we became somehow more enlightened having heard them at all. It was also no surprise then that two musicians with this ability to affect audiences so profoundly proved to be so personable and kind. People think this doesn’t matter, but the truth is that it reflects a kind of social intelligence consistent with these artists’ highly developed musical sensibilities. For what is music if not a social experience, and what is performance but the demonstration of thorough competence and elegant improvisation within particular social spheres?